The national brand A&W Root Beer review by Handy Father: Wow! This root beer is so heavily carbonated, that it masks the flavor. A&W boasts that it’s made with aged vanilla, but even the vanilla is masked by this over-carbonated beverage. The only discernible flavor is that of mediocre vanilla and sugar. The lingering flavor is that of high fructose corn syrup. A&W is light in color, and produces little head. It is unimpressive when put up against other root beers. On a positive note, A&W Root Beer smells pretty good. 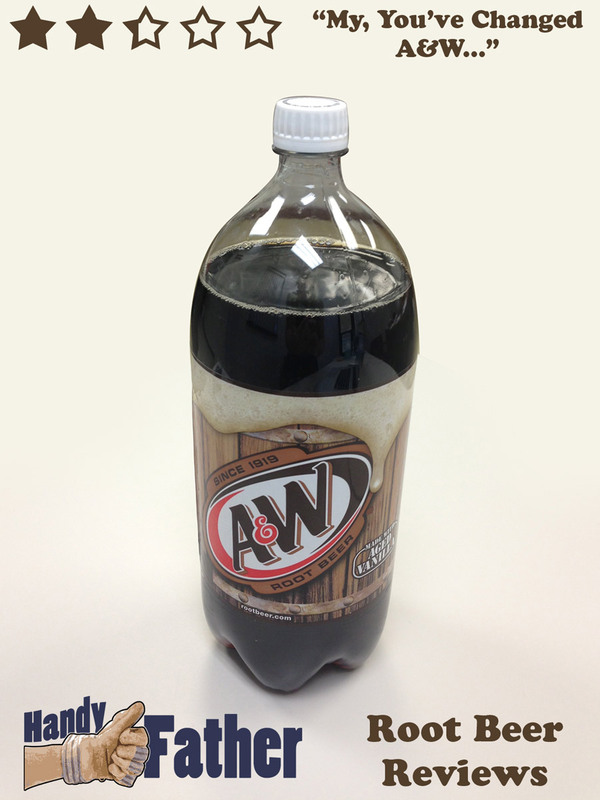 A&W root beer has been made since 1919, but we suspect that the recipe has changed considerably from its “roots”. If you think of the A&W from your youth, and then taste this root beer, you’ll be unsatisfied and disappointed. Ingredients: Carbonated water, high fructose corn syrup, caramel color, sodium benzoate (preservative), natural and artificial flavors, quillaia extract. Bottled under the authority of Dr. Pepper / Seven Up, Inc. of Plano, TX. We at Handy Father give the A&W Root Beer Review a score of 2.25 out of 5 stars. This is a drinkable root beer, but sub-par for sure. Do you have a differing opinion? Give your A&W Root Beer review in the comments below or tweet @handyfather.